It's macaroni and cheese all grown up! 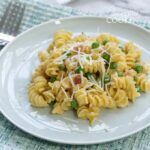 You'll love the flavors and simplicity of this Rotini Peas and Cheese recipe. Bring pot of water to a boil and add rotini noodles, cooking until al dente. Drain, but reserve one cup of the pasta water. Meanwhile, cook bacon in skillet over medium heat. Remove bacon and chop or crumble. Leaving the bacon grease in the skillet, turn heat up to medium-high. Add butter and oil and stir with a wooden spoon. Add onion and saute for 5 minutes, stirring occasionally. Add garlic and sauté for another 30 seconds. Add flour and cook for 1 minute, stirring constantly. Stir in mustard. Gradually add 1 cup milk, whisking continuously; bring mixture to a boil. Cook for 3 minutes or until slightly thickened. Remove from heat. Let stand 5 minutes. Add cheese and season with salt and pepper. Whisk until smooth. Drain hot pasta and immediately toss it with the cheese mixture. Add in peas and bacon. If mixture is too sticky or thick, add small amounts of pasta water to loosen. This recipe for Rotini, Peas and Cheese was printed from AmandasCookin.com - https://amandascookin.com/rotini-peas-cheese/ and can only be printed for education or personal use.